A playwright friend and I were recently discussing the problems we had with shows that were collections of short plays. While these shows are often promising in theory they usually suffer in either consistency, quality or both. And at a deeper level, they often lack a unifying artistic vision that makes for a satisfying evening. The parts remain just parts, never cohering into a whole. By chance, I took this friend to see Wildclaw Theatre’s “Motel 666,” which just so happens to be a short horror anthology; and we were both pleased as (probably poisoned) punch to find that the failings listed above were nowhere to be found. Consisting of seven plays by different playwrights, “Motel 666” nonetheless shares a common cast and a single director, Scott Cummins. 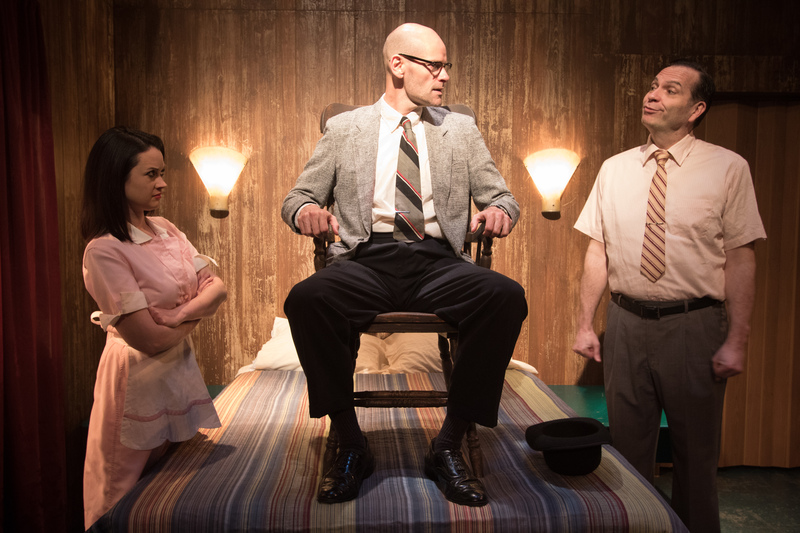 The plays, which vary wildly in tone and aesthetic, are also united by a common location, a dingy room in the titular establishment, as well as by the continued presence of the motel’s off-putting and possibly otherworldly proprietors, played by Natalie DiCristofano and Tony St. Clair. There is indeed a whole here, and it’s a whole lot of fun. Three plays stand out in particular. Brett Neveu’s “Chair of Death” employs screwball rhythms to unsettling affect as a man (Dave Belden) attempts to wiggle his way out of a centuries-old curse. “The Bridal Suite” by Ele Matelan stages a bachelorette party that seeks to answer the age-old question of which is more terrifying: blood sacrifices, eighties fashion or Midwestern housewives. And “The Fourth Wall” by Christopher Hainsworth, tells of a husband and wife (Mike Rice and Katie McLean Hainsworth) whose sniping and bickering grows worse as a disturbing painting on the wall slowly unlocks a memory deep inside her. Its infusion of domestic deterioration with subtle supernatural dread makes it the evening’s highlight. Wildclaw Theatre at the DCASE Storefront Theatre, 66 East Randolph, wildclawtheatre.com, $15,. Through June 28.